48 Commonwealth (255 Berkeley) is located on the SE corner of Commonwealth and Berkeley, with 46 Commonwealth to the east, 50 Commonwealth (260 Berkeley) to the west, across Berkeley. 25-27 Commonwealth to the north, across Commonwealth, and 247-249 Berkeley to the south, across Alley 437. 48 Commonwealth (255 Berkeley) was built ca. 1864 as the home of dry goods merchant William Chadbourne and his wife, Isabel (Patterson) Chadbourne. Isabel Chadbourne’s parents, James H. Patterson and Isabel (Bates) Patterson, lived with them. They all previously had lived at 8 Park Square. They continued to live at 48 Commonwealth in 1865. William Chadbourne acquired the land on which 48 Commonwealth was built on September 29, 1863, from attorney Henry Larned Hallett, a lot with a 47 foot frontage (including a portion of the lot where 46 Commonwealth would be built). Henry Hallett had acquired the lot on October 31, 1862, from shipping merchant and US Congressman Samuel Hooper. It was part of a larger parcel that Samuel Hooper had purchased on May 2, 1860, from the Commonwealth of Massachusetts. He and his wife, Anne (Sturgis) Hooper, lived at 27 Commonwealth. Click here for an index to the deeds for 48 Commonwealth. 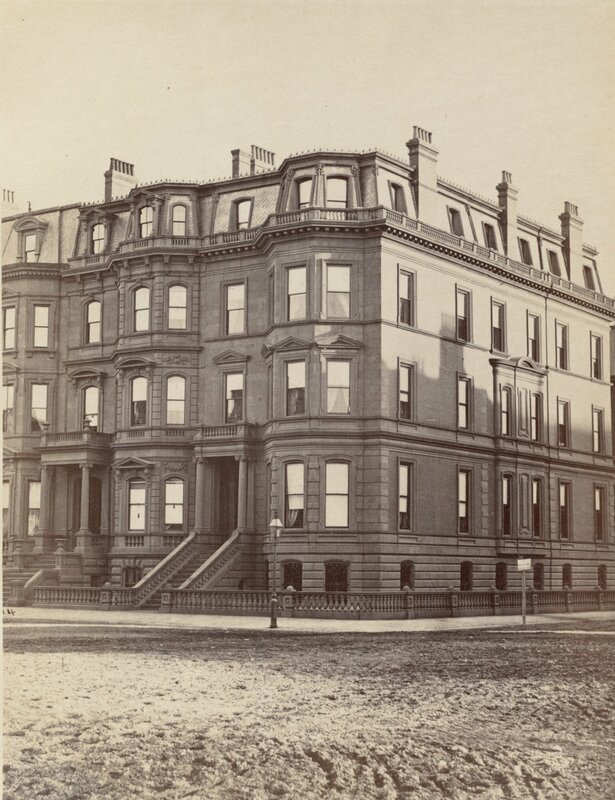 Henry Hallett may have begun construction of the house, inasmuch a May 15, 1863, Boston Daily Evening Transcript article listing the owners of houses built or under construction in the Back Bay includes the Henry L. Hallett residence at the southeast corner of Commonwealth and Berkeley. His deed to William Chadbourne, however, only mentions the land, not a dwelling house. Henry Larned Hallett and his wife, Cora (Lovell) Hallett lived at 31 Chester Square. 48 Commonwealth probably was designed by architect John Roulstone Hall. His January 13, 1911, obituary in the Boston Globe indicates that in 1859 “he designed a house for William Chadburn [sic] at Commonwealth av and Berkeley st., costing $100,000.” The year is clearly incorrect, inasmuch as the land had not even been sold by the Commonwealth in 1859, and the cost appears high. However, given the precise reference (which was repeated in his obituary published the same day in the Boston Herald) it seems likely that he did, in fact, design the house. If so, it is also possible that he designed 46 Commonwealth, given the close similarity of design and contemporaneous construction of the two houses. The Chadbournes and Pattersons continued to live at 48 Commonwealth in 1866. They also maintained a home in the Longwood district of Brookline, where they all had moved by 1867 (William Chadbourne died there in May of 1868). On December 19, 1866, 48 Commonwealth was purchased from the Chadbournes by George Blackburn, a dry goods wholesale merchant. He was a widower and his son-in-law and daughter, David Nevins, Jr., and Harriet (Blackburn) Nevins, lived with him. David Nevins also was a dry goods manufacturer and merchant. They all previously had lived in Roxbury. George Blackburn died in February of 1871. David and Harriet Nevins continued to live at 48 Commonwealth in 1876, but had moved to South Framingham by 1877. On April 11, 1876, 48 Commonwealth was purchased from Harriet (Blackburn) Nevins, who had inherited it from her father, by David Pulsifer Kimball. He and his wife, Clara Millett (Bertram) Kimball, made it their home. They previously had lived at 37 Hancock. David Kimball was a lawyer until 1873, when he retired from practice to devote his time to his railroad investments. He served as an officer and director of numerous railroads, including serving as treasurer of the Chicago, Iowa & Nebraska Railroad and later as president of the Nashua & Lowell Railroad. The Kimballs’ three children — Clara Bertram Kimball, Katherine Preston Kimball, and David Kimball — lived with them. Clara Kimball married in November of 1883 to David Mason Little of 2 Commonwealth and they moved to Salem. Katherine Kimball married in October of 1895 to banker John Harsen Rhoades, Jr., and they moved to New York City. And David Kimball married in September of 1903 to Amelia Ingeborg Gardiner, after which they lived in France. Clara Kimball died in 1920. David Kimball continued to live at 48 Commonwealth until his death in August of 1923. On May 26, 1924, 48 Commonwealth was purchased from David Kimball’s estate by real estate dealer James M. Burr. In June of 1924, he applied for (and subsequently received) permission to add an entrance on Berkeley Street, and in July of 1924, he amended the application to also lower the front entrance on Commonwealth Avenue from the first floor to street level. The remodeling was designed by architect Frederick O. Lewis. In June of 1926, James Burr applied for (and subsequently received) permission to convert the property from a single-family dwelling into a private club, The Hub Club, with fifteen sleeping rooms. 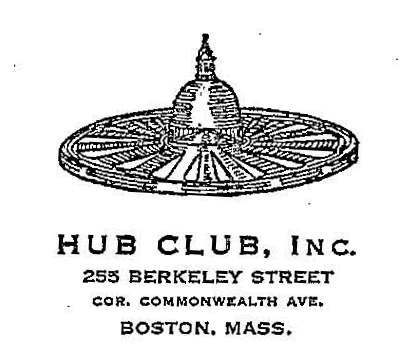 In addition to The Hub Club, 48 Commonwealth/255 Berkeley also was the location of various offices and, from about 1928, a tea room operated by Miss Emily G. Webb. The tea room previously had been located at 8 Newbury. By 1933, Miss Webb also served as treasurer of The Hub Club and lived at 255 Berkeley. 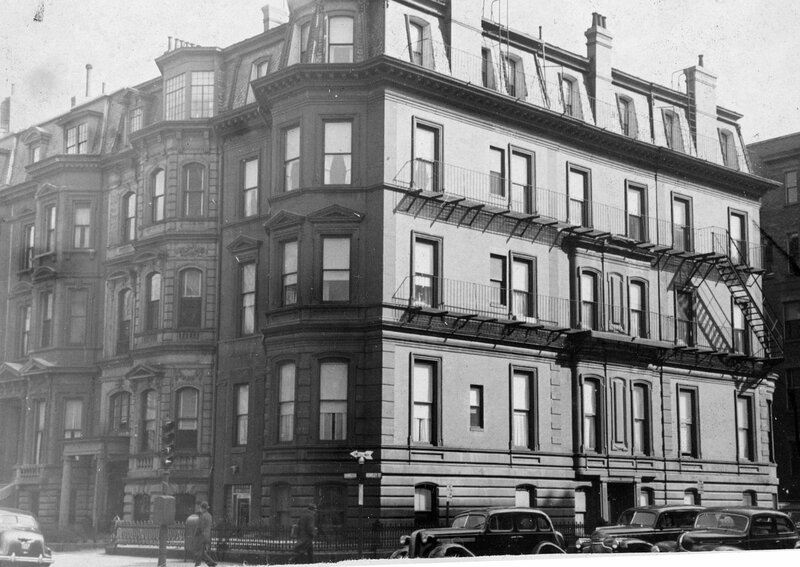 From about 1928 through about 1932, Frederick Lewis, who designed the remodeling in 1924, maintained his offices at 255 Berkeley; he and his wife, Anna Louise Teresa (Sutor) Lewis also lived there. On May 31, 1930, the building was seriously damaged by fire, requiring repairs on all floors. On April 5, 1932, the Boston Penny Savings Bank foreclosed on its mortgage to James Burr, and on October 7, 1932, it sold the property to Frederick E. Ordway. The Hub Club (which appears to have changed its name to The Club by 1934) and the tea room remained at 48 Commonwealth until about 1936. 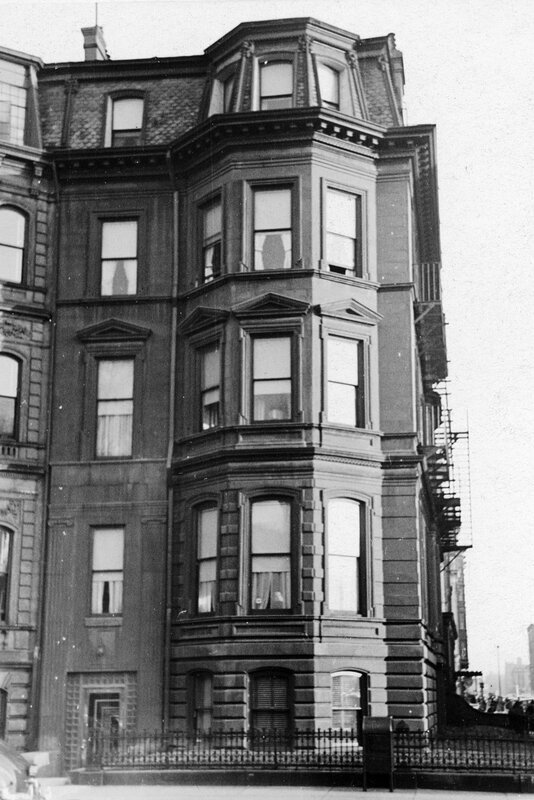 By 1937, Miss Webb’s tea room was located at 12 Newbury and she was living at 10A Louisburg Square. On July 9, 1935, the Boston Penny Savings Bank foreclosed on its mortgage to Frederick Ordway and took possession of the property. In February of 1938, the bank applied for (and subsequently received) permission to convert the building from a private club to eleven apartments and four medical offices. At the same time, they also modified the Commonwealth Avenue entrance. The remodeling was designed by architect Herman L. Feer. On March 30, 1938, the Boston Penny Savings Bank sold 48 Commonwealth to Walter Phillips. On September 5, 1940, it foreclosed on its mortgage to Walter Phillips and once again took possession of the property. In January of 1941, the bank applied for (and subsequently received) permission to increase the number of apartments to thirteen and reduce the number of medical offices. On February 3, 1942, 48 Commonwealth was acquired from the Boston Penny Savings Bank by William Katz. In September of 1942, he applied for (and subsequently received) permission to increase the number of apartments to fifteen, eliminating all of the remaining medical offices. 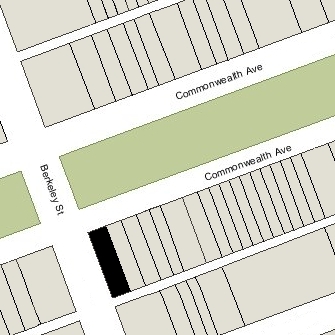 William Katz remained the assessed owner of 48 Commonwealth through 1948. 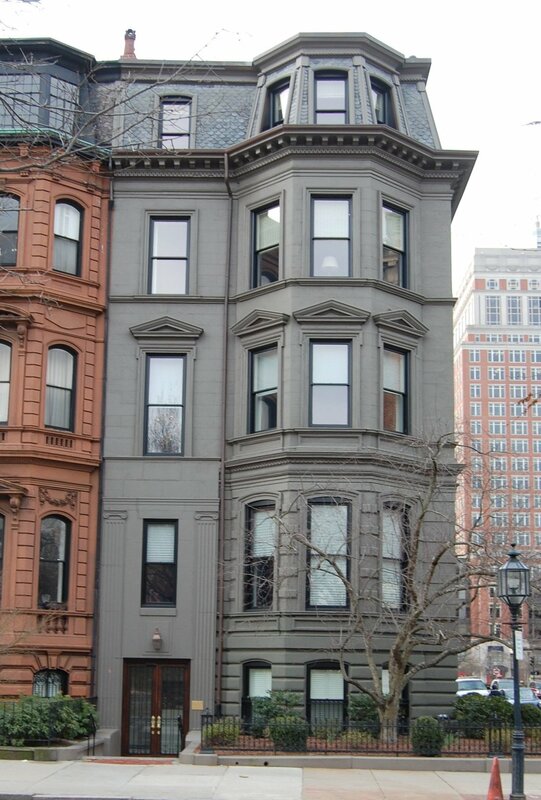 On March 2, 1948, two deeds were recorded, the first dated February 3, 1942, transferring 48 Commonwealth from William Katz to Jean Fuchs, the wife of Rabbi Sol Fuchs, and the second dated July 27, 1942, transferring the property from Jean Fuchs to Phillip Grossman of Brooklyn, New York. On December 27, 1951, Philip Grossman transferred 48 Commonwealth to his daughter, Jean (Grossman) Fleischman, the wife of attorney Louis I. Fleischman. On September 27, 1960, 48 Commonwealth was acquired from Jean Fleischman by the Mall Realty Corp. and on June 26, 1961, it was acquired from the Mall Realty Corp. by Barnett Feldstein and his wife, Edith (Martin) Feldstein. On January 15, 1963, 48 Commonwealth was acquired from the Feldsteins by Maurice Galer. He was a beverage manufacturer and also a real estate dealer in partnership with his sons, Lawrence Irwin Galer and Michael Master Galer. Maurice Galer died in January of 1968. 48 Commonwealth subsequently was owned by the Maurice Galer Trust, which he had established on January 15, 1965, to hold his properties for the benefit of his wife and children. In August of 1971, Lawrence Galer applied for permission to reduce the number of apartments from fifteen to thirteen, replacing the two former apartments with a drug store and a coin-operated laundry. His application was denied and his subsequent appeal dismissed by the Board of Appeal. On December 1, 1975, John P. Bennett and John E. Dineen, trustees of the West Lothian Trust, purchased 48 Commonwealth from the Maurice Galer Trust. On September 6, 1978, Andrew B. Rose and Gerald Gouchberg, trustees of the Northern Rose Realty Trust, purchased 48 Commonwealth from the West Lothian Trust. On September 4, 1979, 48 Commonwealth was purchased from the Northern Rose Realty Trust by William Lewis Hodgins, a residential interior designer. In October of 1979, he applied for (and subsequently received) permission to reduce the number of apartments from fifteen to twelve. 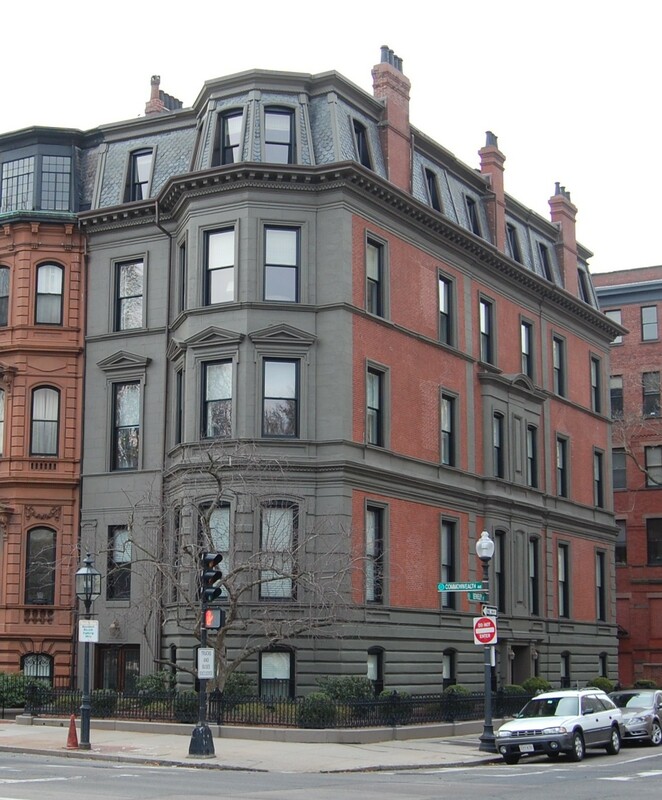 On March 28, 2005, the Stonegate 48 Comm Ave LLC purchased 48 Commonwealth from William Hodgins. In April of 2006, they applied for (and subsequently received) permission to significantly remodel the house into six apartments. On May 25, 2007, Stonegate 48 Comm Ave LLC converted 48 Commonwealth into six condominium units, the 48 Commonwealth Avenue Condominium.